Have you ever wondered why Cambridge largely escaped the scarring caused by large road schemes seen in so many other towns? Yes there is Elizabeth Way bridge and the railway bridge on Hills Road (now tamed) but otherwise the city missed out on the urban motorways so in fashion in the 1960s and 70s. In the 1960s the view was the cities were going to become engulfed by a tidal wave of cars that would suffocate them and destroy their vitality. The video Look At Life – Living with Cars 1964 explains the mood at the time and is well worth a watch. The video mentions the key report at the time, Traffic in Towns, aka the Buchanan Report that carefully analysed the situation and suggested solutions that involved building ring roads, controlling parking (yellow lines), car parks and the segregation motor traffic and pedestrians on two or three vertical levels, amongst other things. Diagram of the proposed road network in the Future Shape of Cambridge. The Main Town Road was designed for “very heavy volumes” of traffic at 40mph with entry and exit points at near motorway standards. It would fly over or under main roads. The diagram shows the proposed link between Barton Road and Brooklands Avenue across Coe Fen. Brooklands Avenue would have had a large multi-level interchange at each end. 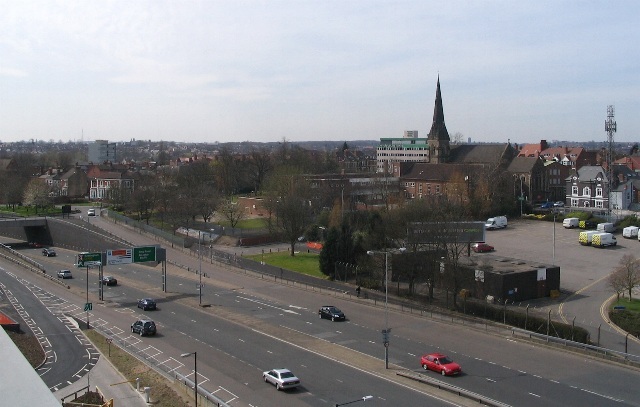 The area to the north of Mill Road – the York Street, Sturton Street and Norfolk Street areas – were expected to be cleared and redeveloped and would have seen this road running through it. New shopping was to move to the now Grafton Centre. 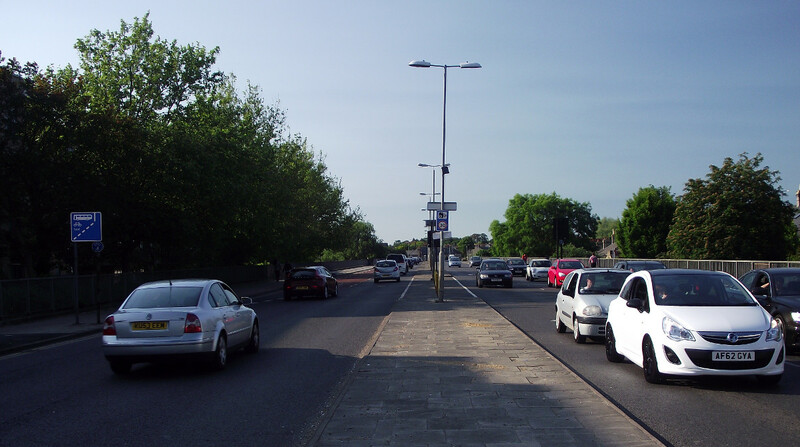 The Chesterton Lane and Castle areas look like they would have been turned in to a traffic-filled area with a new crossing over the river to feed Park Street car park. The diagram suggests that in addition to a (presumably) four lane road there are additional local lanes running on each side between the interchanges, bringing the width to six lanes in most places. The west side of the city, which had been largely reserved for an enlarged university precinct, would have benefited by the demolition of Fen Causeway and the closure of Queens Road and Grange Road to cross traffic. This would have allowed a pedestrian dominated precinct from the city centre to the western edge for the university’s use. The impact of such a massive road is difficult to imagine so I was considering trying to mock-up what this might have looked like in Cambridge but it turns out that there is no need as Coventry provides a suitable example. Its ring road hugs the city centre with a length of 2.5mi and was completed in 1971. It provides distribution to the central shopping and parking area as well as long distance journeys (although this role is now much diminished through subsequent road building). Coventry had a medieval centre although much of this was destroyed by bombing in the Second World War, leaving the ground clearer for redevelopment. Nonetheless the traditional street pattern was swept away to build the new road network and car parks. These two pictures of modern day Coventry show the huge amount of land taken by a four lane road designed for 40mph with grade-separated junctions – and the vast impact on the cityscape. White Street ring road junction in Coventry, from Bing Bird’s eye view. Click the image to explore all the ring road in Bing maps. Can you imagine Cambridge in 2013 with a necklace like this? Elizabeth Way was built and gives an impression of what parts of the city would have looked and sounded like if the entire road had been built. Fortunately the City Council was not the highway authority and had neither the power nor the money to carry out these plans at the time. This entry was posted in History, Planning, Roads and tagged Cambridge, Coventry, Development plans, Traffic in Towns by rich257. Bookmark the permalink. You’ve overlooked the section of East Road that was dualled in the 1960s, before the Main Town Road scheme was hatched. That scheme had a very short life and the County Council reverted to the “Super Highway to Nowhere” (as dubbed by “Braingrader” in the 1970s) improvement scheme to East Road, Gonville Place and Lensfield Road. The County Council very nearly completed the East Road dualling in 1985, a scheme that had begun before it was scrapped after the Tories lost control in the County Council elections in May of that year. Thanks Colin, it’s always good to have the insight of someone who was around at the time. Yes, there is quite a bit more of the story to tell before and after this publication – I’m still researching and will post more in due course. Wow, fascinating! Although the ring road proposal didn’t happen (aren’t we so very lucky about that! ), the one-way streets into town are interesting. I don’t find the sneering at Coventry very kind; a city that suffered badly at the hands of the Luftwaffe and then saw most of its industry decimated in the 1980s and 90s. It was a major manufacturing centre in its day and required good transport links. Believe it or not many people in Coventry are actually proud of their ring road! I’m sorry you see the comments on Coventry as sneering, I tried to describe it in factual terms. I would say that it is without question that the ring road had a vast impact on the cityscape, it is arguable whether it was positive or not. I did live in central Coventry for a number of years and have first-hand experience of some of the effects this road has on the city. I think such a scheme would have had a devastating impact on the character of Cambridge, which is the focus of the post. Thanks for the reply and explanation. While I honestly don’t think you intended to sneer there was definitely an air of “aren’t we lucky to live in Cambridge rather than this dump” on here. And you’d be right to call Coventry a dump, it is a dump… but it’s our dump! Of course in the 70s it was a futuristic paradise and people came for miles to see the new precinct and work in the huge car factories. If anything Coventry is much more a victim of Thatcherism than of the ring-road so derided on this blog. I wonder how Cambridge would fare without the M11? There was inded much innovation and futuristic vision in Coventry with the post-war redevelopment including the first pedestrian shopping precinct. This vision and boldness seems to be missing in more recent developments in the UK. I felt that it was the later developments in Coventry centre that diluted the original scheme, such as Centrepoint blocking the precinct and Cathedral Lanes closing the link to the cathedral, as well as lack of maintenance that gave the centre a dowdy air in recent times, or ‘dump’ as you describe it. 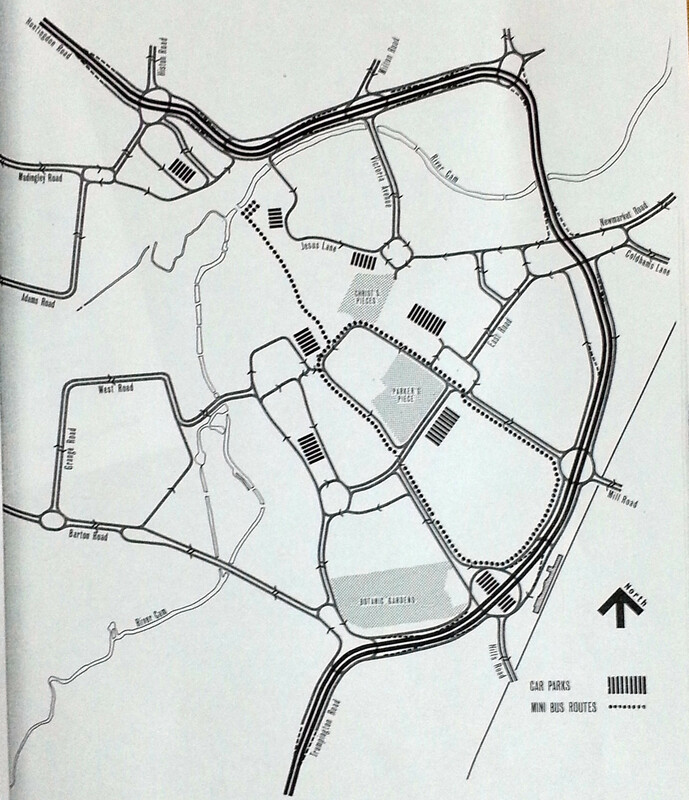 While Coventry’s ring road allowed traffic to flow relatively freely it did rather cut off the centre from the rest of the city. The city’s fortunes seem to have followed that of volume UK car manufacturing over the last century and more diversity would have helped. Cambridge has only recently escaped from a small-town and university-centric mentality that could have seen it become a picturesque backwater — the policy was to keep large scale manufacturing outside Cambridgeshire. Clearly these are two different cities with different histories and the transport network is part of the story of how they have developed and continue to do so. Sometimes doing nothing is the best option? Look at Bridge St, where St John’s demolished the houses fronting the road, and Magdelene St, where similar plans were shelved due to lack of money. Politicians and planers need to remember that today’s priorities may not last into the future – see Concord.